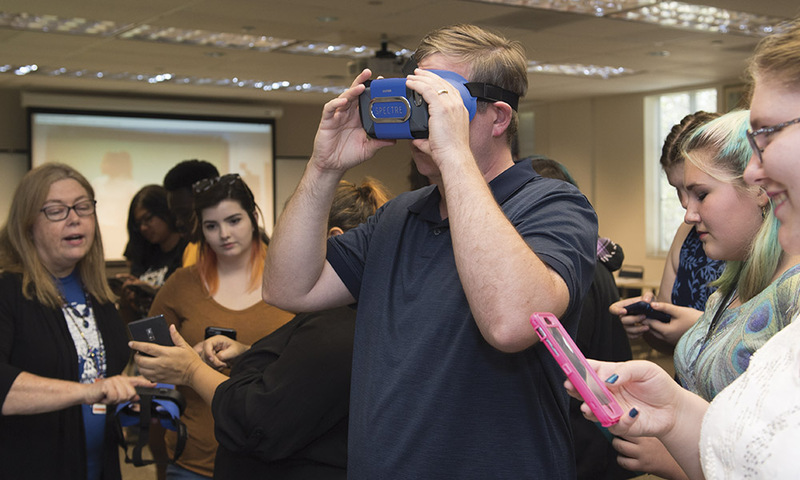 Using a virtual reality headset, students turned their smartphones into 3D virtual reality machines, thanks to virtual reality apps and games that they can download on their phones. 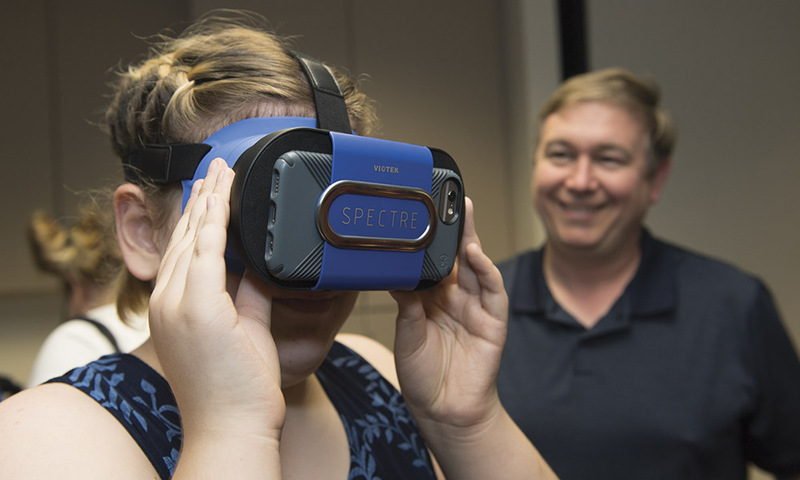 Students tested virtual-reality headsets to experience the world in three dimensions. 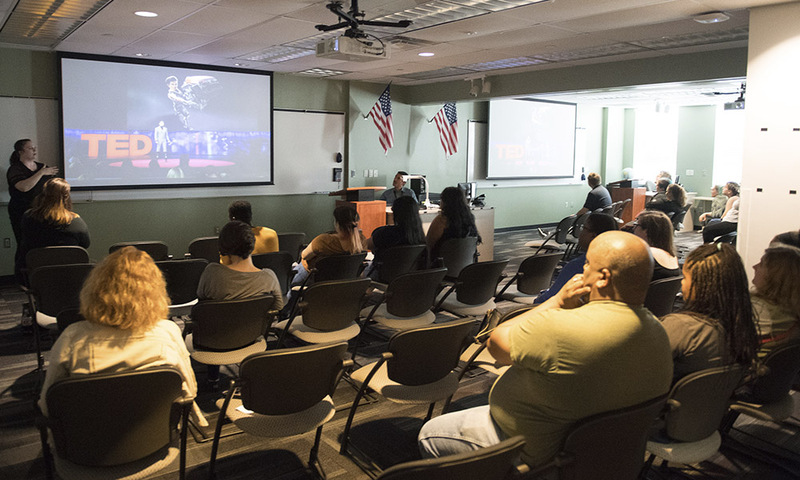 Valencia’s Winter Park Campus hosted a TEDxLive event in April, showing students and the public TED talks from the recent Age of Amazement TED conference in Canada. 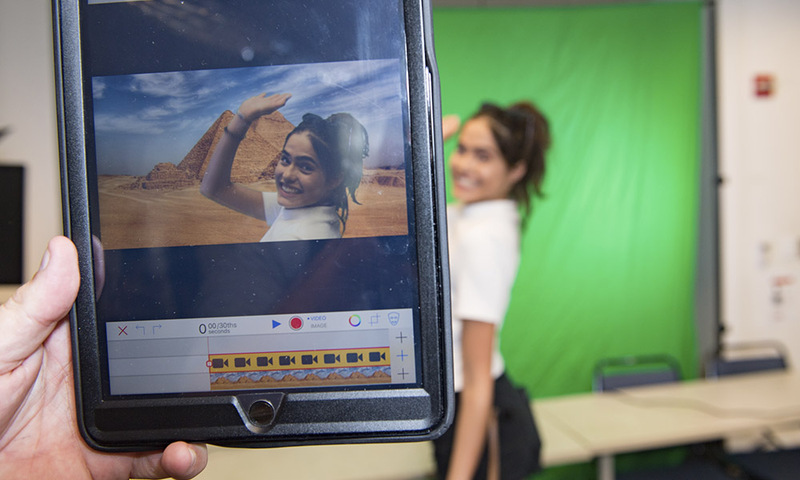 Students learned how to use green screens to insert themselves and their friends into digital backgrounds. 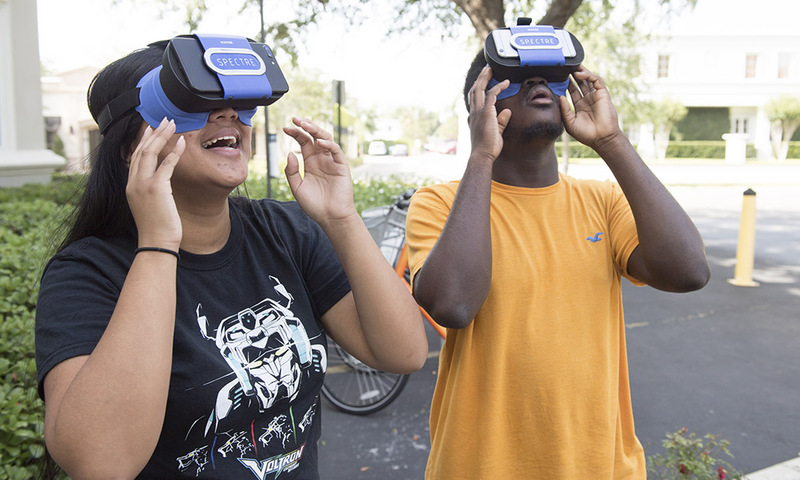 Students were wowed by the chance to test virtual-reality goggles at Winter Park Campus’ TEDxLive event in April. 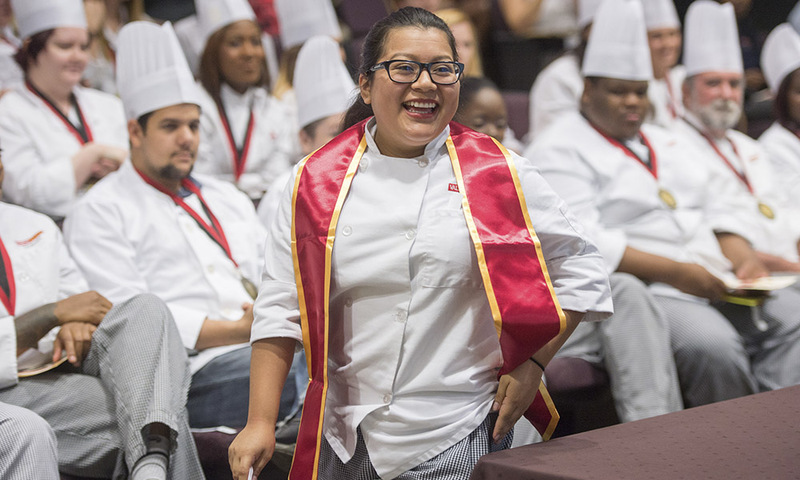 The event recognized graduates from Valencia’s culinary, baking and pastry programs. 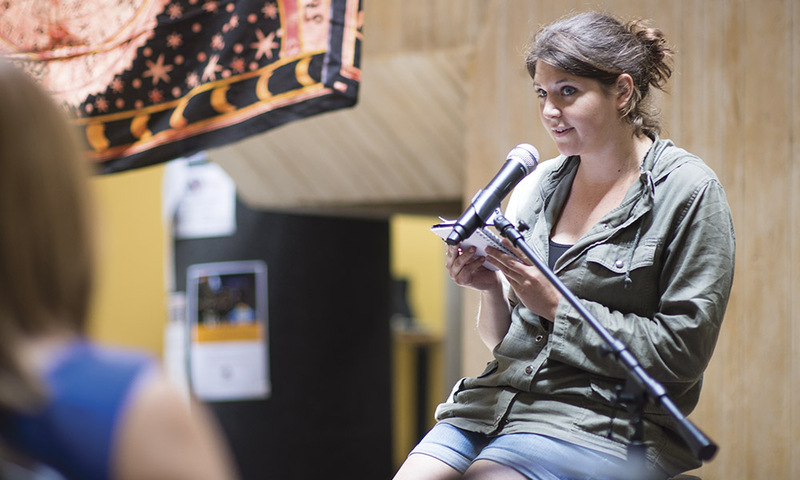 Rebecca Rubio was named one of the program’s distinguished graduates. 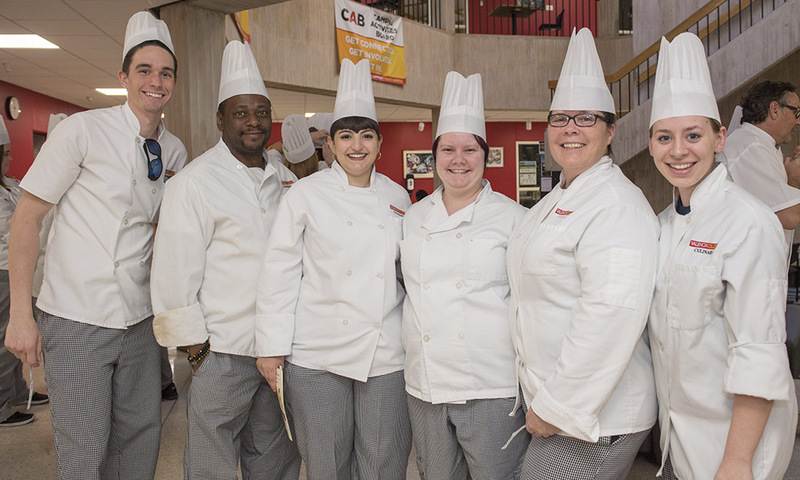 Culinary students were wearing big smiles (and toques) as they celebrated their graduation. 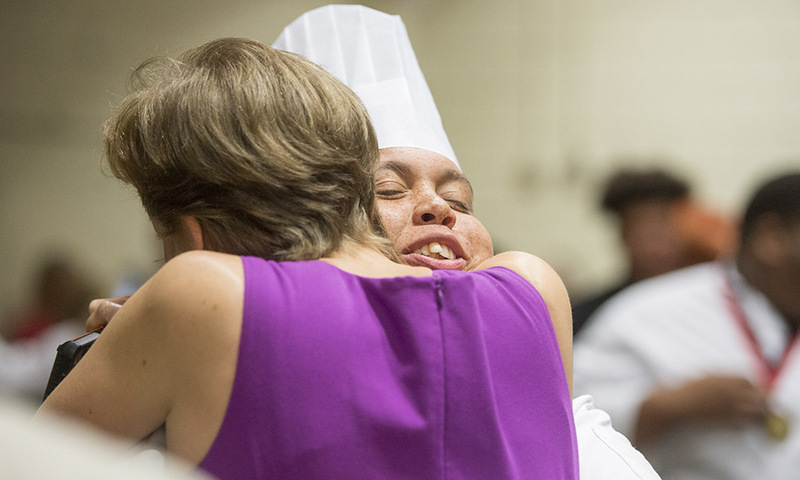 There were lots of hugs at Valencia’s Culinary Medal Ceremony on West Campus in April. 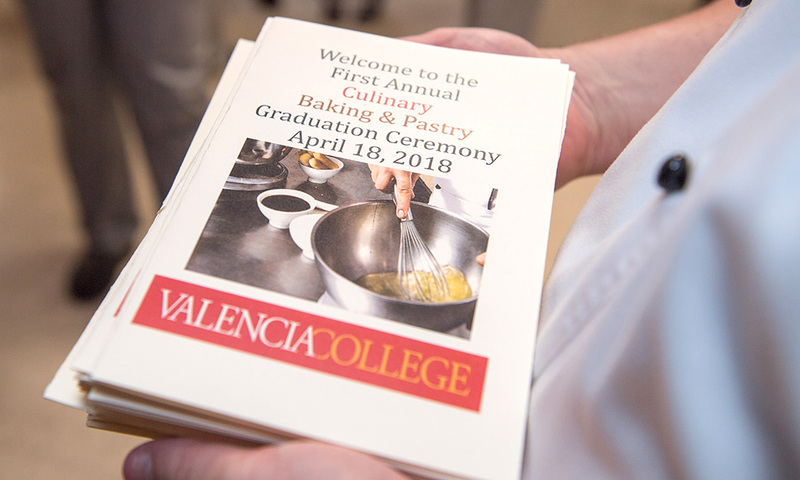 For the first time in the college’s history, Valencia’s Culinary and Baking & Pastry faculty honored this year’s graduates at a medal ceremony held in April on the college’s West Campus. The 35 graduates celebrated completion of their degrees and applauded outstanding graduates in each program. 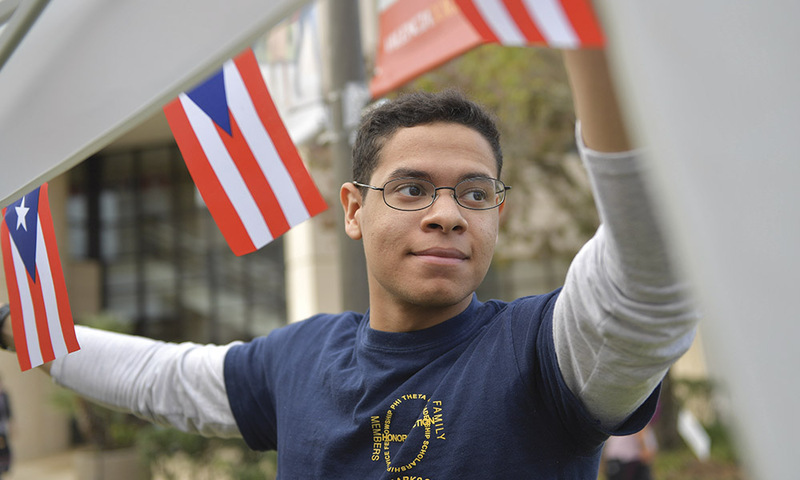 On Jan. 11, Phi Theta Kappa, East Campus, welcomes students who have relocated from Puerto Rico to Orlando after Hurricane Maria. No city slickers here. 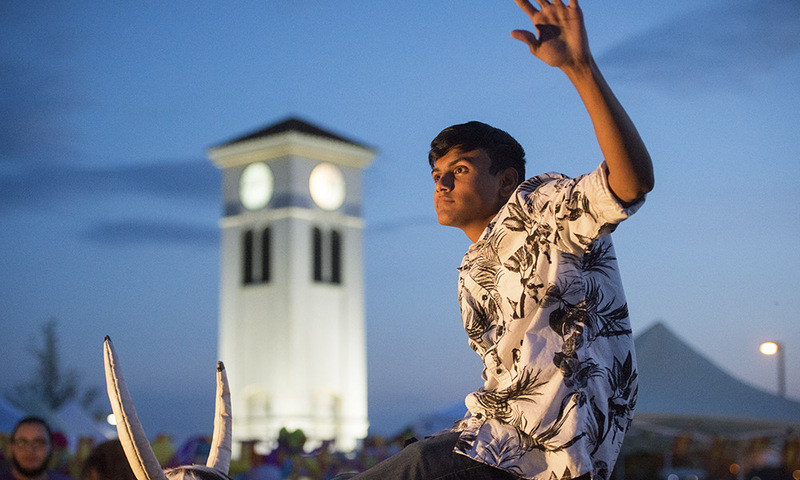 An Osceola Campus student takes the mechanical bull for a joyride at Night of the Bull. 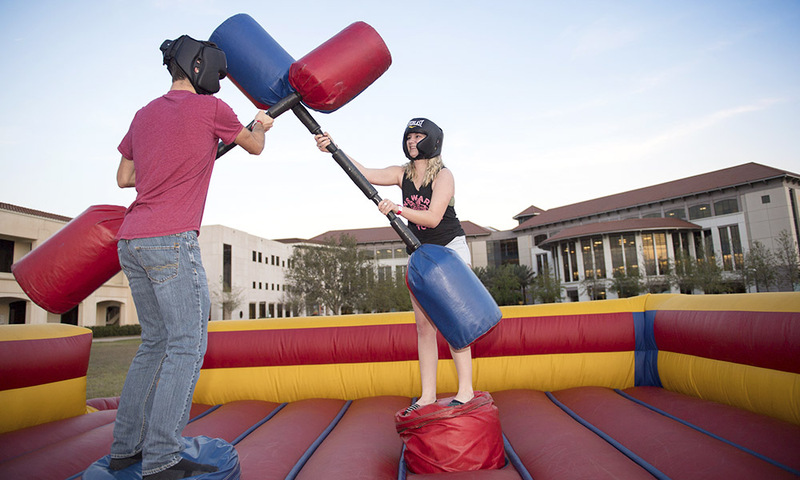 Gladiator jousting is one of the most popular games at Night of the Bull. 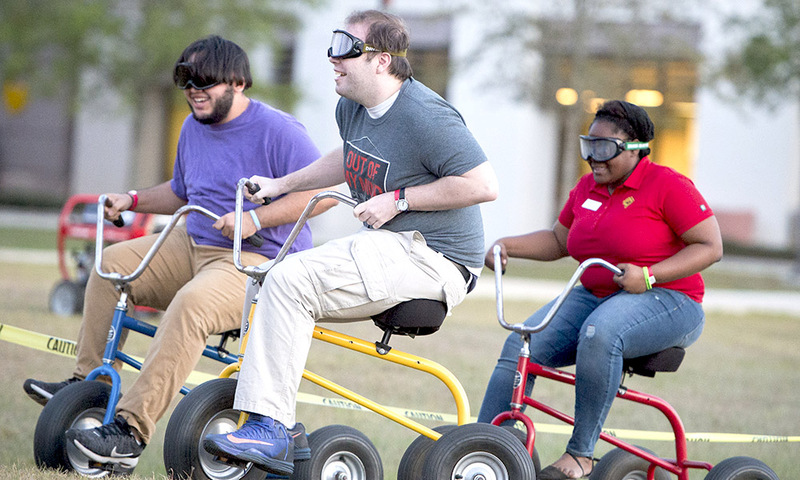 Students kicked off festivities with a pre-dusk tricycle race at Osceola Campus’ annual Night of the Bull festival in March. 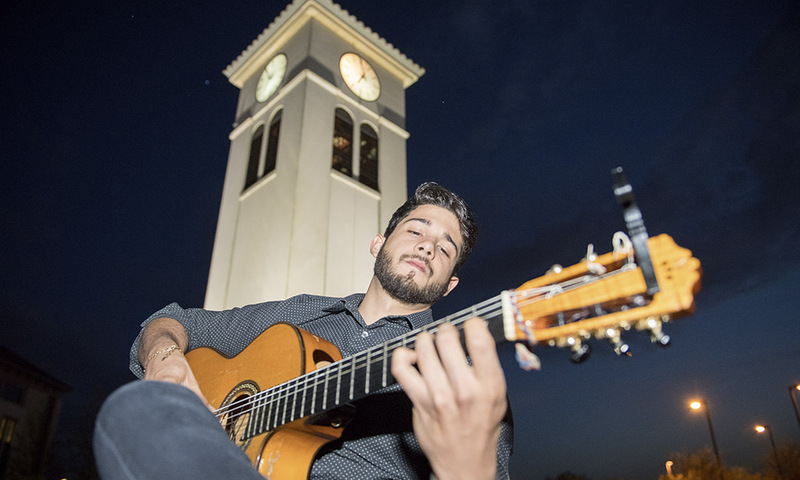 A student played flamenco-inspired Spanish guitar beneath the iconic Osceola Campus clock tower at Night of the Bull. 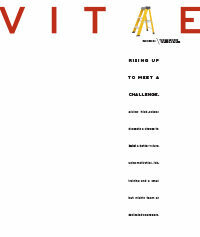 Students competed to see how long they could stay atop the mechanical bull. 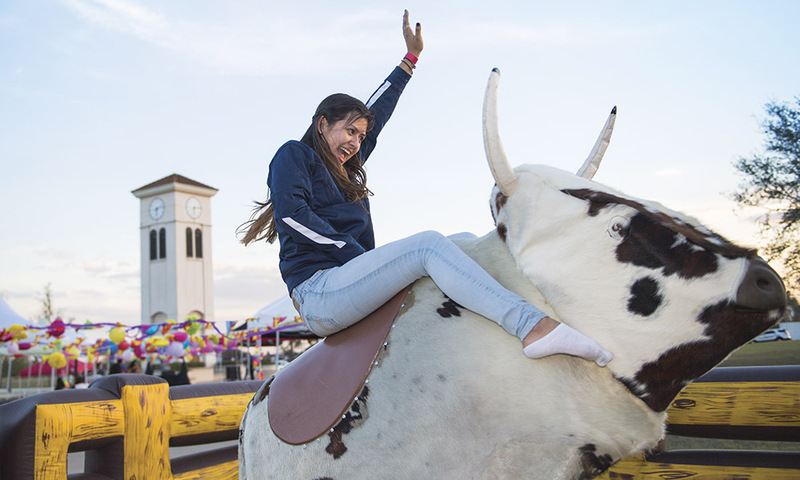 Students get to ride a mechanical bull at the Osceola Campus’ annual Night of the Bull, on March 6. 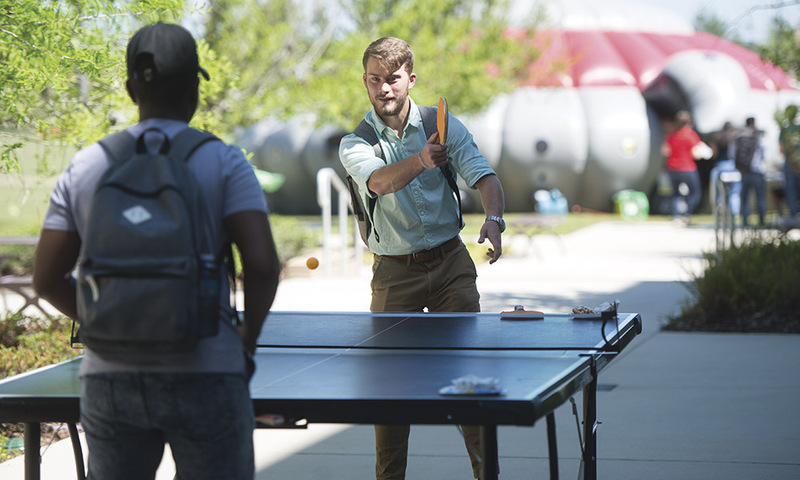 Lake Nona Campus students ease into finals week, on April 19, with a “stress-busting” event, including laser tag, a photo booth and henna tattoos. 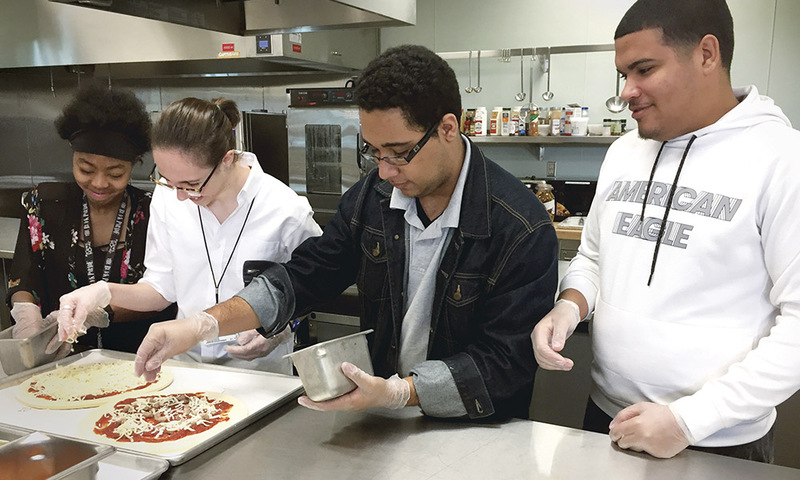 High school students get a taste of our culinary program during a tour of the Poinciana Campus. 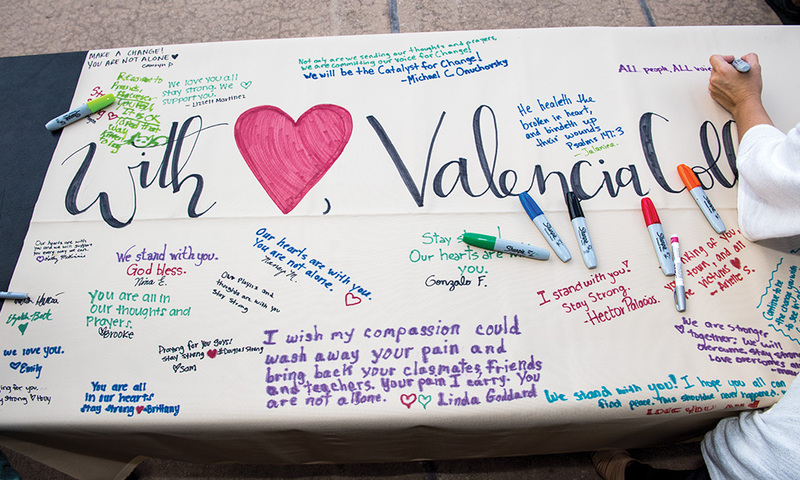 Valencia’s West Campus hosted a production of Bryan Doerries' “Theater of War” in January and invited local veterans and their families to the event. In “Theater of War,” writer/director Bryan Doerries (far right) and New York actors Marjolaine Goldsmith and Chris Henry Coffey perform a new translation of Sophocles’ “Ajax” — an ancient play about the tragic legacy of war. 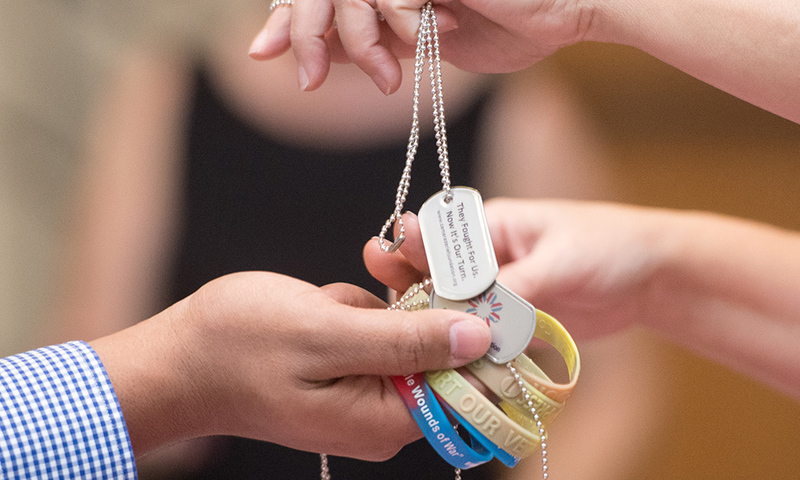 Denise Reed tears up while recounting her experiences as a military wife whose husband served in the Army Reserves during several deployments. 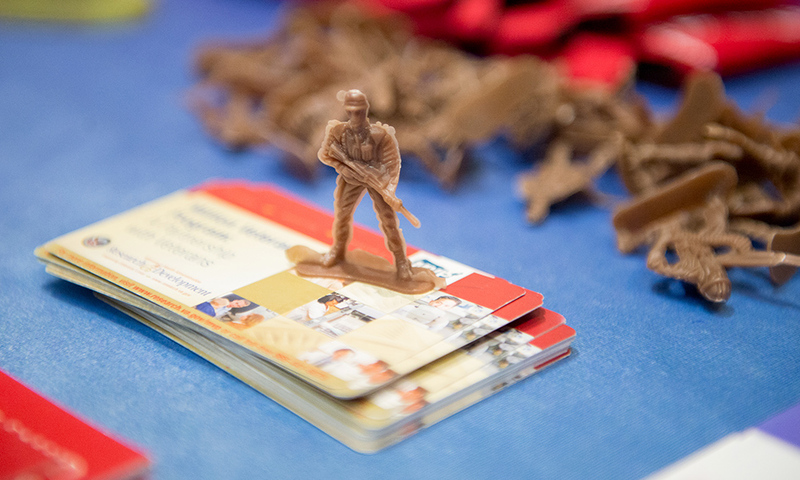 “Theater of War” aims to foster understanding and compassion for service members and their families. 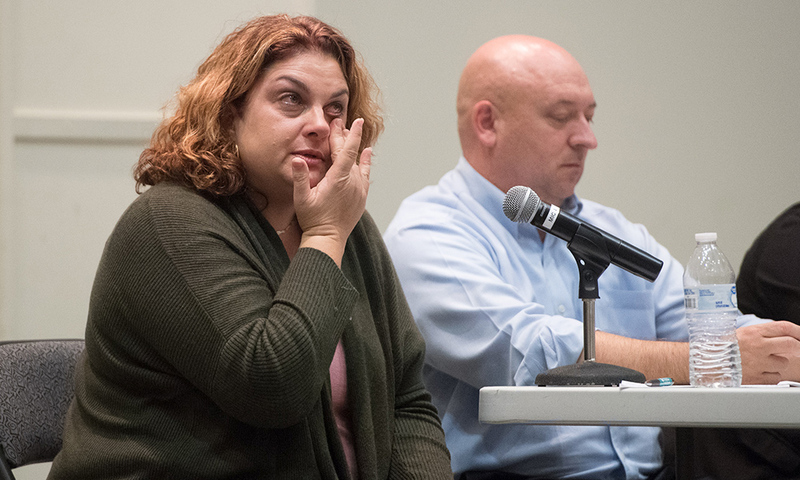 New York actors, Marjolaine Goldsmith, Chris Henry Coffey and Bryan Doerries, perform a reading of Sophocles’ “Ajax” during “Theater of War,” on Jan. 24, followed by a West Campus discussion about the challenges facing today’s veterans and their families. 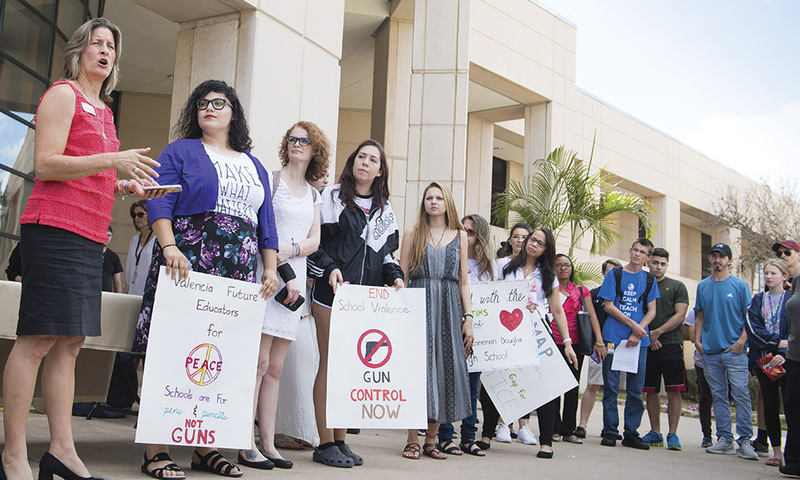 Students rally on East Campus, on Feb. 21, to show solidarity with Parkland High School students, after a February shooting that left 17 dead at the Broward County high school. 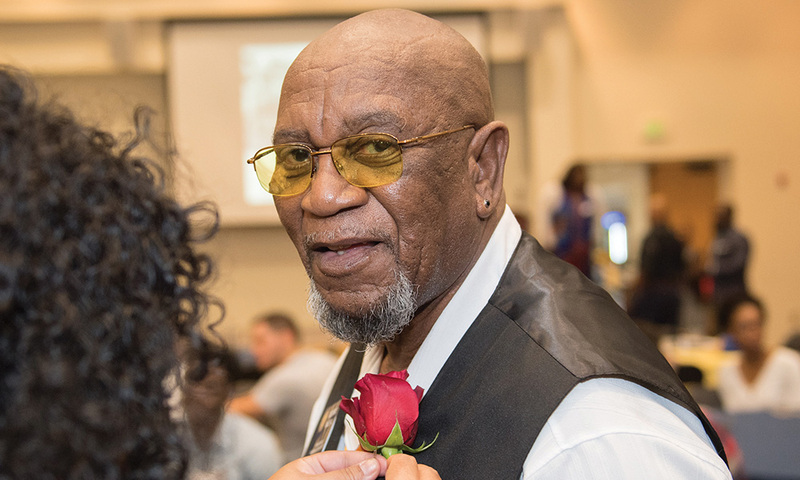 West Campus students and community members gather on Feb. 26 to honor the contributions of African-American veterans in the U.S. military. 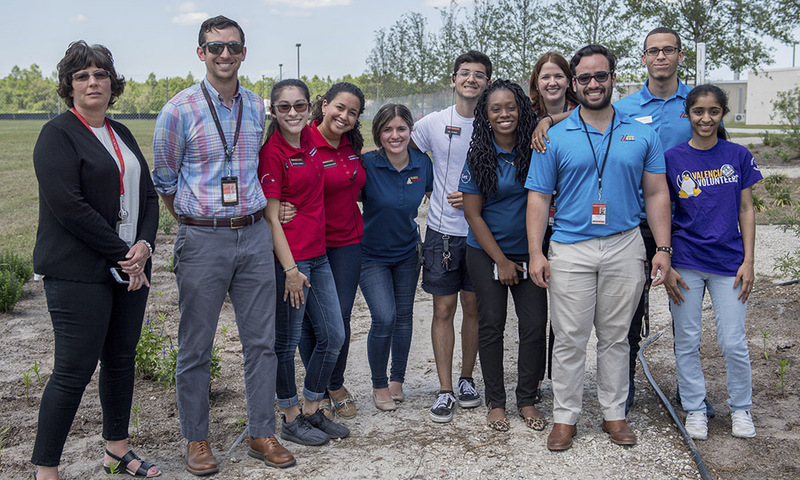 Students and staffers planted butterfly-friendly flowers at Osceola Campus’ Save the Earth Fair in April. 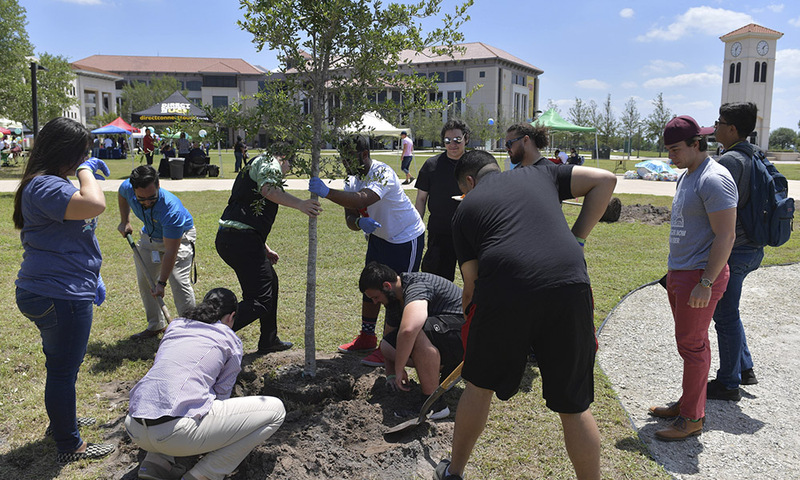 Planting trees in the campus peace garden was a team effort for students and employees. Staff and student volunteers weren’t afraid to get dirty to beautify the campus. 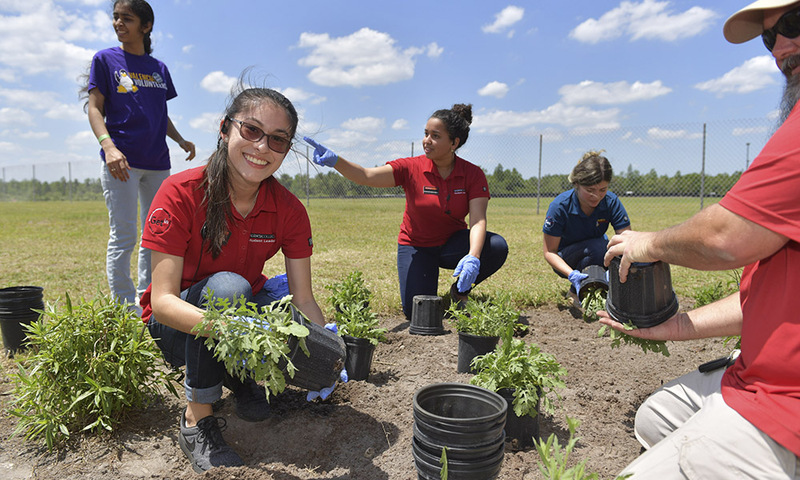 Students planted flowers and butterfly-friendly plants at the Osceola Campus Earth Day Event. 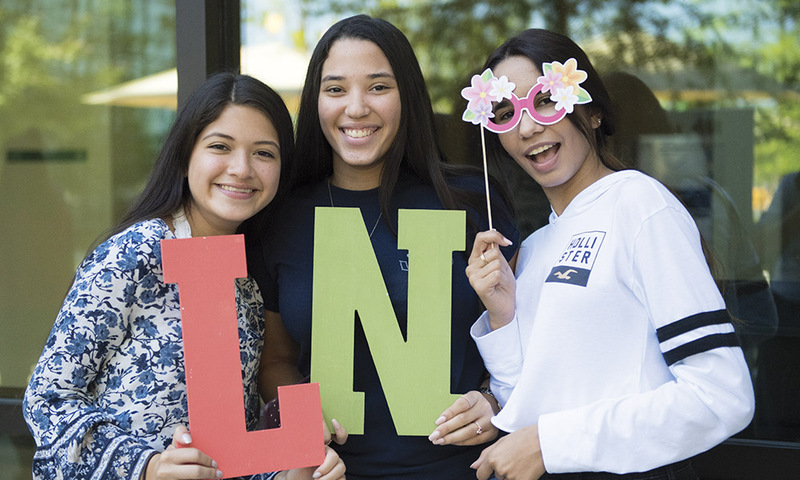 Students performed slam poetry, hip-hop and literature to reflect on the ways we survive and overcome physical and metaphorical storms in our lives. 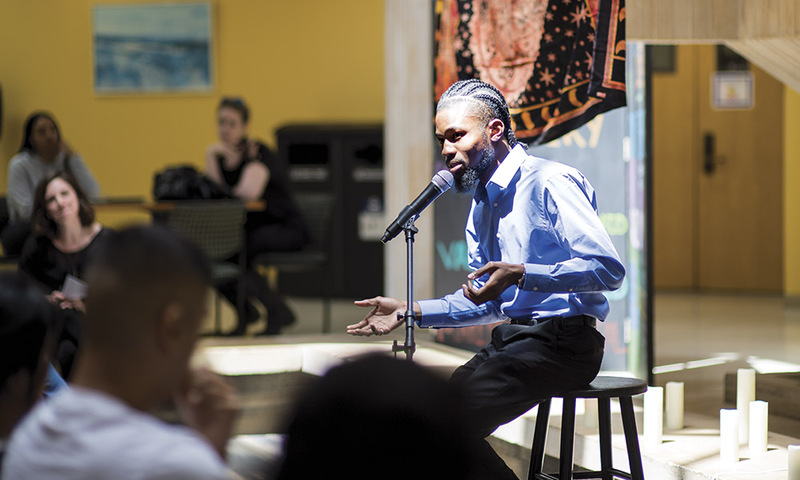 West Campus held a Poets Café in March to celebrate diversity. Quillen Crenshaw performs his poem “The Acceptance of the Introduction”. 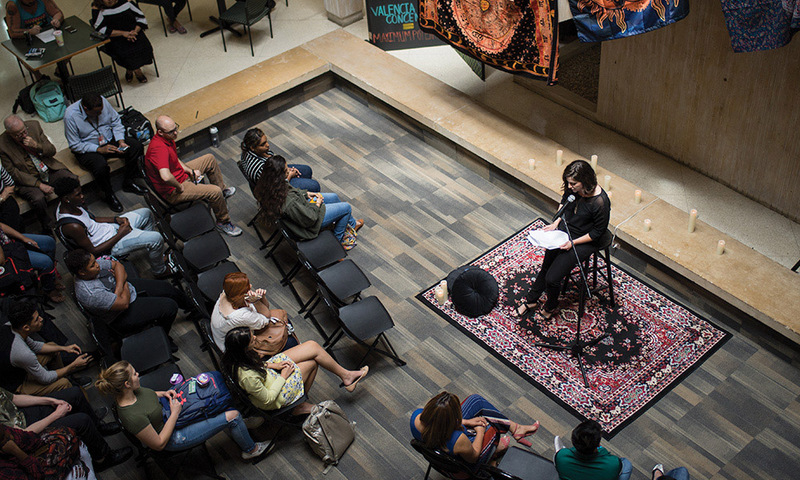 Faculty members and students pay tribute to the written (and spoken) word at the West Campus Poetry Jam, on March 29. 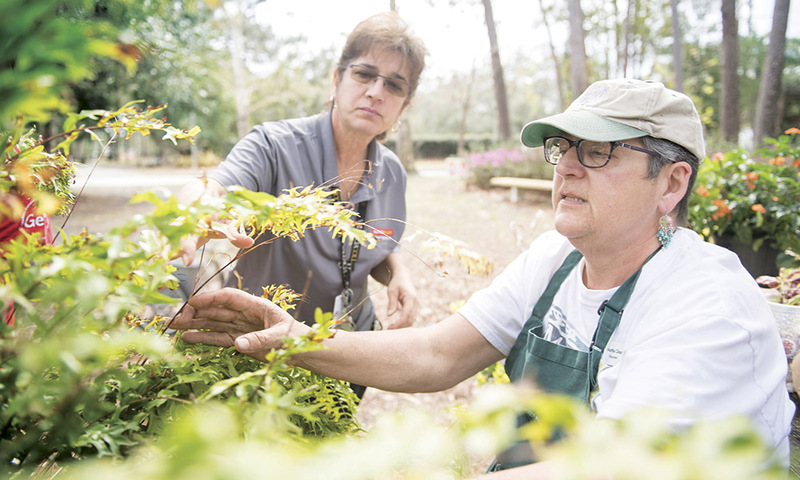 Employees from East and Winter Park campuses pitch in to help spruce up Mead Gardens during the college’s annual Learning Day, on Feb. 9. 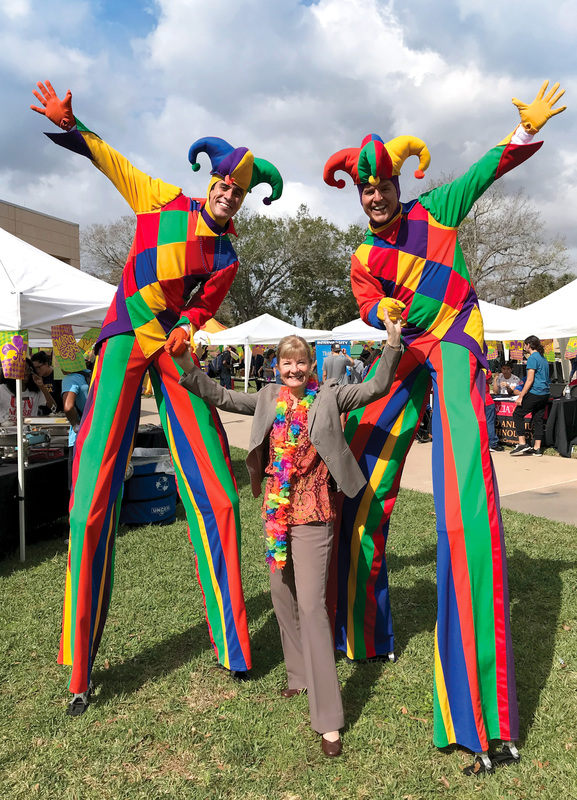 East Campus president Stacey Johnson celebrates Mardi Gras in high style with these two jesters. 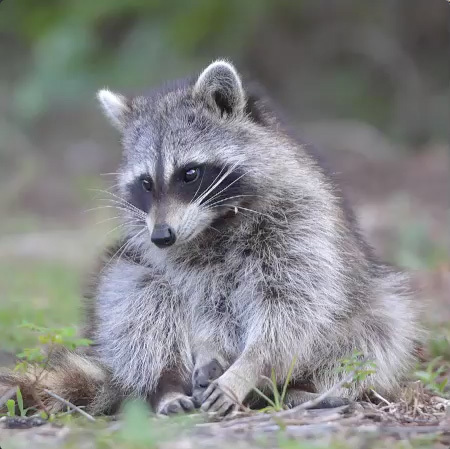 One of our furry friends spotted on campus.